Riders now avoiding forest because they are scared of "being threatened by Police." I was interested to read the response by the FC which raises more questions than answers. It is correct to say Alice Holt is a clay forest. That is why they have gravelled the forest rides (fire breaks) for cyclists. It is a pity that they have been gravelled down the middle and signposted 'cyclists only'. Put to one side and there would have been room for horses on the turf or the edge of the gravel. They know how fragile the clay is so why let their contractors mash it up and not reinstate the surface? Why are the off gravel paths, such as they are, not kept trimmed back? At the moment they have become overgrown and are unuseable. I note that they have engaged a group of riders that see the need for investment. Well of course they would engage those who have not had a lifetime of neglect by this quango. If they can invest in all the facilities already in place and apply for yet more planning permission, why do these riders think that they should raise funds to provide something which they have paid for over many years? They should know that local riders have tried to engage the FC many times and used to have a riders liason committee. That disappeared with the present management. Where are the facts and figures which show damage by horses? They do not damage the gravel rides and off gravel rides have all been fenced off. 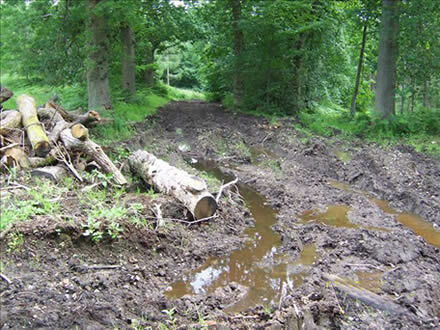 This causes a problem because horse riders need escape routes if they see or experience difficulties. They say demand needs to be managed so how many of the 300,000 visitors a year are horse riders? How many permits have they sold for Alice Holt this year? Are those permits just for Alice Holt? How many of those visitors arrive by motor vehicle? There seems to be a conflict of interest between the income from car parking and the biodiversity of the forest. They are right to say that it is divided into relatively small areas and admit the very busy state of the roads. Why then have they not tried to facilitate horse riders crossing the A325. When asked by the Local Highway Authority if they would like help in this respect when the A325 was subjected to major refurbishment a few years ago they said they had no plans to enable this as it was too dangerous to cross in any case. 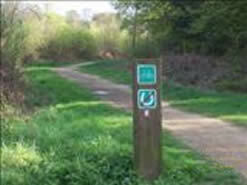 They are also correct to say that it is not well connected to existing rights of way. That is because all existing ROW stop at the FC boundary and become footpaths if anything. They have frequently been asked to upgrade so that a horse rider may cross the forest to reach bridleways on the other side. Not all will want to buy a permit to ride entirely in the forest. The forest forms an obstruction in this respect. For the most part horse riders are local people who just wish to partake in a rural pastime without hindrance or fear and in relative safety.The Forestry Commission have shown themselves to be entirely negligent in this respect. Is it right that they should generate this amount of traffic on our rural lanes and then ask local people to pay in order to avoid the obvious dangers? Even when permits are purchased horse riders are not given a safe or tranquil environment or any recognition of their special needs of which tranquility is foremost.When this has been pointed out the response was "Horse riders think themselves too precious, they will have to learn to mix with people." That says it all really and for an organisation which publish 'Equality and Diversity' as,"respecting and valueing the benefits that diversity brings. So that whoever we work with and whatever services we provide, everyone deserves to be included and valued regardless of their ethnicity, age , gender, sexual orientation or faith, and whether or not they have a disability" we can only wonder how they can justify making a few country people pay to use the open public space on their doorstep and at the same time provide absolutely nothing for that payment. Many of these people will fit the "special characteristics" recognised in their publication entitled 'Diverse Woodlands, Diverse communities". It could be said that the Forestry Commission in this part of the country is nothing if not hypocritical. Why should riders have to pay to gain access to areas that are free to everybody else? It is not fair and just another way of taxing riders. What is the reason (according to the Forestry Commision) for taxing riders? Surely there must be a good reason for this???? or not? When are horse riders really going to start pulling together NATIONALLY as a group with a united voice in order to prevent this sort of thing? We have been driven off the roads, driven off pavements even though they are obviously safer than the roads, given no regard whatsoever for our safety or our horses' safety, there is no consideration from other 'countryside' users such as those who blast off fireworks willy-nilly all the year round, off-roaders and cyclists, dog owners. I used to ride in Central Park New York and found it a lot more enjoyable and safer than any rural riding in this country. What a sad indictment this is for our nation. I live right by the forest and walk in the forest once or twice a day. I see no reason why riders can not use the forest and think that that permit system is unnecessary. It is very expensive. I ride in the Bourne Woods and Frensham regularly and I see no damage caused by horses so it is only a money making exercise. I do ride on the bridleway through the middle sometimes which is always a good spook lesson for my young horse as we negotiate past the playgrounds! We must keep using this path or they will try and close that too! For good public relations, the FC should manage horse riding in Alice Holt in the same manner in which it manages walking & cycling - or does it manage the numbers of walkers or cyclists? Collectively walkers & cyclists must cause damage. Do the walkers & cyclists walk & ride through the muddy clay soils......? What paths have been put down for them and how have they been paid for? The FC needs to take a look at its discriminatory policies. But perhaps all these issues will disappear if the Forest is sold off and there are redundancies of FC staff. "I don't know why we find this so suprising. "They are about to sell off the forestry and want to sell it as a going concern - no matter that this is all highly discriminatory and unprofitable by way of permit production and general policing." " However, less outcry, more action - how many of those affected have taken the time to solicit support from their parish, borough / district, County Councillors or better still, petition your Local MP and get him to write to the Chief Exec of Forest Enterprise with the salient questions of how much it actually costs to run such a scheme and the facts that it is highly discriminatory (unless they are bringing in permits to walk and cycle over the land as well) and also WHY." "FE have always liked to say horses damage the routes through the forest but we all know that a wheeled vehicle (including cycles) cause more damage on non-sealed surfaces and can prove it (take a tray of dirt, a jug of water and a little thin wheel to show them and then point out that a hoof is in and out without that continuous water flow effect." " Until we start to use statutory instruments / procedures we are simply terriers yapping in a wasteland."